Article first published October 2017 in Global Aquaculture Advocate. The current national seafood trade deficit is running over $14 billion annually. More than 90 percent of the seafood that we eat is flown or shipped in from other countries. The United States lays claim to the most expansive Exclusive Economic Zone (EEZ) on the planet. How curious, then, that not a single fish has yet been commercially grown in U.S. federal waters. That really does need to change! The Ocean Stewards proffered five broad areas where current regulations might be amended to help offshore aquaculture come home to America. 1) Designate NOAA as the lead federal agency for any and all applications for aquaculture activities in U.S. waters. The lack of a designated lead agency for aquaculture has resulted in regulatory gridlock. The Rose Canyon Fisheries project off the coast of California, for example, has floundered about for years, while NOAA, EPA and USACE strived to determine who should take the lead agency role for the environmental reviews. The Ocean Stewards are urging NOAA to accept this responsibility for all aquaculture projects, by coordinating the project review process, and leading the implementation of the following recommendations. 2) NOAA should set up a Geographical Information System (GIS) that provides guidance to offshore aquaculture proponents (both commercial fish farmers and researchers) for preferred ocean areas (Preferred Offshore Waters for Aquaculture, or POWA). NOAA needs to make GIS information on ocean use and oceanographic factors readily available to the public, and to aquaculture project proponents. The GIS should indicate POWA areas where offshore aquaculture projects would not significantly conflict with other ocean user-groups, and would represent no significant risk to the existing marine environment. The GIS database should describe parameters for each POWA, such as: minimum water depth; substrate type; distance from any Essential Fish Habitat or sensitive habitats; and potential conflicts with other user groups (transportation, oil and gas extraction, underwater telecommunication cables, etc.). 3) NOAA should conduct an overarching EIS for a range of aquaculture activities in the POWA areas described within the GIS as suitable for aquaculture, to define the operational parameters under which projects could expect rapid approval. NOAA should compile an EIS that stipulates the provisions by which an aquaculture project proponent must abide, to be able to obtain approval in a timely manner in the POWA areas described above. To prevent such a programmatic EIS from falling into a black hole, as has happened with the California aquaculture permit process, NOAA should be instructed to complete this process within 12 months. This EIS should include review by EPA and USACE, so that it has broader agency buy-in. The idea here is that if an offshore aquaculture project is proposed which falls within these stipulations, then it would be considered to be covered by the prior EIS, and further NEPA review would not be required by NOAA, EPA or USACE. This pre-approval by NOAA, EPA and USACE would only relate to projects with specifically-defined characteristics (e.g. species cultured; volume of fish cultured; amount and type of feed provided; mooring and net pen engineering pre-requisites) and for specific areas (POWAs identified in the GIS, described above). If an applicant meets these operational stipulations, then an individual aquaculture permit could be granted by NOAA alone, without additional review by EPA and USACE. 4) Set a 180-day limit on NOAA’s review of commercial aquaculture applications. Time and money … any offshore fish farming proponent usually has very little of either. And it is almost impossible to raise the money for an offshore project if you do not have the permit. The Stewards therefore suggested that to prevent any bureaucratic stalling, a 180-day clock be established for NOAA’s permit processing. There is already a useful precedent for this in Hawaii, where if the state’s Land Board does not make a decision on any Conservation District Use Application within 180 days, then the permit is automatically granted. Other agencies (EPA and USACE) might then have an additional 90 days to review NOAA’s decision, and accept or reject the application for the other relevant permits (NPDES permit and Section 10 permit). 5) Establish a framework for expeditiously granting Experimental Aquaculture Permits (EAPs) in Federal waters (3 – 200 nm offshore), under the existing Exempted Fishing Permit regulations. Kampachi Farms’ Velella Beta-test with only 2,000 kampachi. It took NOAA around two years to provide the permits for each iteration of this small-scale research project culturing a native fish that is already farmed commercially in these waters around Kona, Hawaii. Over on the other side of the wall, the Mexican government helps foster innovative aquaculture through what is called a “Fomento” permit; designed, as a tool to, well, foment. The idea is that experimental offshore aquaculture permits should be readily available, to encourage innovation and experimentation. There is sound science in support of such a measure: all the available evidence indicates that so long as an aquaculture project is small in scale, and cultivating species that are native to the area, and so long as no vulnerable habitats are located within the immediate vicinity, then no significant, lasting impact can occur to offshore waters or substrates. 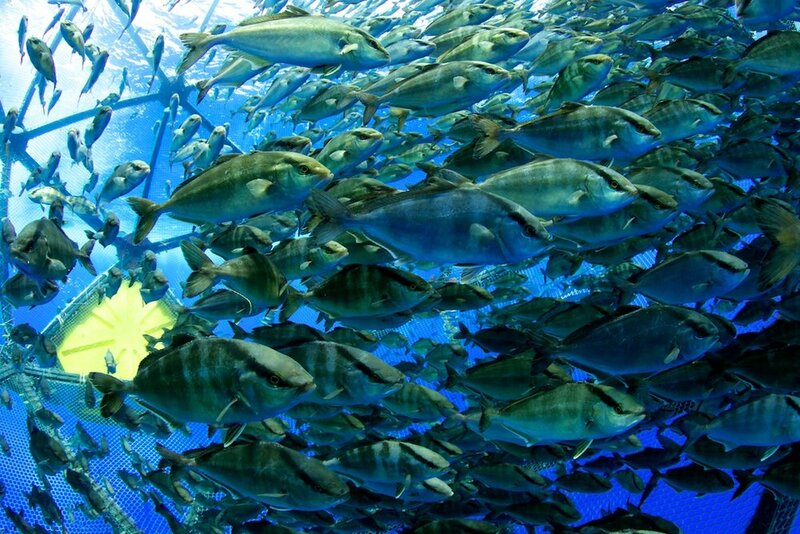 Once the fish are harvested, and the experimental structures are removed, then the area generally returns to its pre-impact state within six to 12 months. Given the absence of both significant and cumulative long-term environmental consequences, the risks of short-term impacts, naturally remedied by time, are far outweighed by the pressing need to facilitate growth and innovation in American aquaculture. The Stewards therefore proposed that NOAA should establish regulations to allow expedited granting of Exempted Fishing Permits for aquaculture projects that are (a) temporary, (b) small-scale (c) non-commercial, and (d) located in federal waters, over 3 miles offshore. Where is there any possible downside to this step? We suggested that – in the same time-conscious spirit of the above recommendation, a limit of 30 days should be set for NOAA to complete the review of such an application. We believe that these steps would enable innovative, sustainable offshore aquaculture to flourish in U.S. waters. This could help reverse the imbalance of seafood trade, revitalize working waterfronts, create high-paying jobs in the U.S. aquaculture sector and seafood processing sector, and increase the quality and availability of healthful, domestically-grown seafood for American consumers. What, then, must we do? An open letter, and a challenge.